Mercure Hotel Offenburg am Messeplatz. Book now! Wifi! Offenburg the gateway to the Black Forest located close to the centre of the Ortenau invites you. Strasbourg, Basel and Karlsruhe can be reached within short time. The Offenburg fair is our immediate neighbour and within walking distance. Fasnet, Bollenhut and Black Forest like the wine and Mercedes Benz to us. Days and feast for 300 people in the hotel and for 3,000 people in the adjacent Offenburg fair. An ideal meeting and conferences. On my way back from Italy, I arrived late at the hotel. Still, everything was handled quickly, understanding, fast and friendly! Everything you need and more is available in the room (coffee for in the morning, a little saloon, a bath…). Follow the parking directions for the Messe, then choose for hotel parking (10 €). The hotel is excellent being both close to Offenburg Centre and also to the motorway network to visit other cities and countryside. The hotel also has a good restaurant for breakfast and dinner as well as a great swimming pool. Overall I was not impressed and do not recommend to stay here. Rooms are old and have not been recently refurbished (the room still smelled of smoke; probably from the carpet). I had a privilege room but the promised bathrobes were not present. Minibar drinks were included but no bottle opener was present in the minibar. The airconditioning was not working even though it was a very warm day (and opening a window was not practical due to traffic noise). The parking fee was €10, but this was not previously announced on the web site. 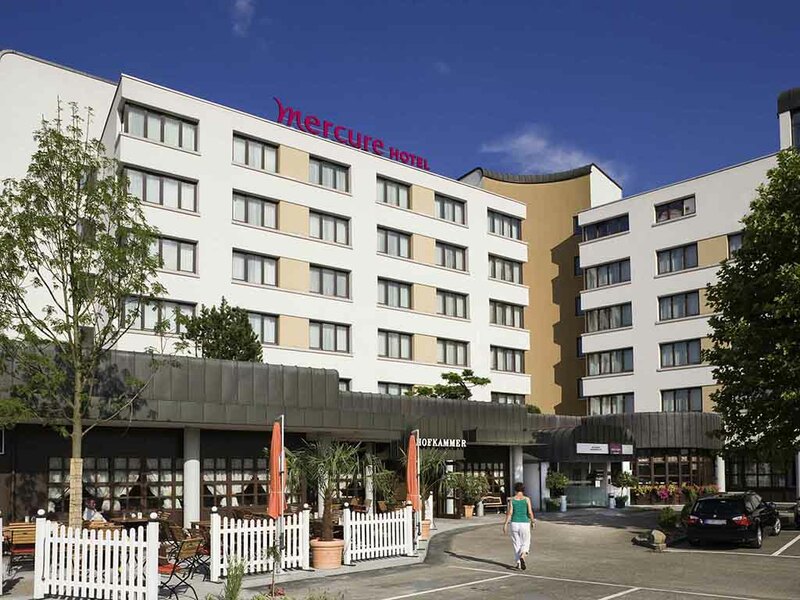 We very much enjoyed our recent overnight stay at the Mercure Offenburg. As always the reception staff were welcoming and professional and our room had been cleaned and prepared to the highest standards. The wide choice available at breakfast is always appreciated as is the attentive and efficient service. During the evening the bar staff were excellent; the service was prompt, helpful and friendly. Normally I would not single out a member of staff from such an excellent team, but Mohammed deserves a special mention For his engaging involvement throughout the evening. Nice hotel well located. I appreciate very much the restaurant and the bar. The swimming pool and the sauna on the top is great. The personnel is very nice and professional. We like the location near to the center of the city and the congress house. We often come to this hotel for pleasure. Offenberg is a good place to stay for the Christmas markets. We were a quite disappointed by the service and décor of the hotel. The carpets are old and corporate. The swimming pool was cold and the sauna / infra rouge room were both switched off. However the proximity to Offenburg and Strasbourg saved the weekend. Prices are hiked in December for the Christmas market. Perhaps we made a mistake booking directly thru the Accor website rather than booking.com. Parking at the hotel ia an extra 10 Euros and the width of the spaces are tight. Mostly it was very enjoyable. The room was big and comfortable, the breakfast was great and the staff were generally friendly and obliging. However, it lost 1 star because of the following: (a) Friday night's meal was interrupted when we were asked to leave our table and finish our meal (desert) at the bar: it was 10:15 pm and we were nearly finished - inexcusably rude (the Cook and most staff left at 10:00 pm despite being advised the restaurant closed at 10:30); and (b), we were unexpectedly told we had to pay and extra Euro 10/night for parking. The cost for 2 cars for 2 nights was too much!. This should have been advised before we booked. It does not seem welcoming when they forget your welcome drink voucher. Do not feel like asking for it as it seems rude. Room clean. Staff in restaurant very good and helped with the internet even though the restaurant had a blind spot and could not connect. Internet worked in the bar. The hotel was clean and offered nice accommodations. I should have done my research better as the location was not ideal, there was absolutely nothing close by. But the restaurant offered a nice evening meal and we were just staying the night as we passed through so it was not a big deal. Overall satisfied with the experience. Hotel is located outside of the city, so if you want to explore, you need to use the public transport/ . Hotel is comfortable. The rooms good. Breakfast really good. Restaurant staff friendly and helpful. Helpful reception staff (we and several guests arriving by car at the same time were unable to raise the barrier) Comfortable, well maintained and clean room. Bar service excellent on a very busy night. Welcome swim in the pool after a long day's drive. Welcome drink, fruit, water and bathrobes in room on arrival. Hearty breakfast before travelling on. Convenient location near autobahn and attractive town. We arrived late but the checkin was quick and the mitarbeiter friendly. Breakfast was good and friendly. Checkout was also good. Close to highway and fuel station for cheap gazoline also. I would definitely book here again. Room and pillows were stinking of cigarettes! Restaurant service very poor - had to call staffs numerous times and wait approximately 10 minutes to get menu card. No shower gel n shampoo (the basic minimum for a hotel to provide!). Most Accor hotels provide water as complimentary drinks in the room, none provided at this hotel. At check-in, no info provided on timing of breakfast, etc.